Please feel free to share this letter with any potential customers. Today I received my framed Marriage Certificate for my husband and my wedding of last June; the Framed Pledge of Love to mark our First Wedding Anniversary, and the unframed Pledge of Love for my sister and brother-in-law's 5th Wedding Anniversary. First of all, I was surprised to receive everything so quickly, as I just supplied you with the information three on Monday evening, and today is only Thursday. I was moved to tears when I opened the box and saw the absolutely beautiful pieces of art I had received. Each is absolutley exquisite and I have never seen any marriage or anniversary certificate, that in any way comes close to the beauty of these peices. The artwork, sentiment, and personalization are beyond words. The frames are magnificent. These will truly be heirlooms. I am thrilled. You were so very kind and helpful as I tried to make up my mind about which items to purchase. 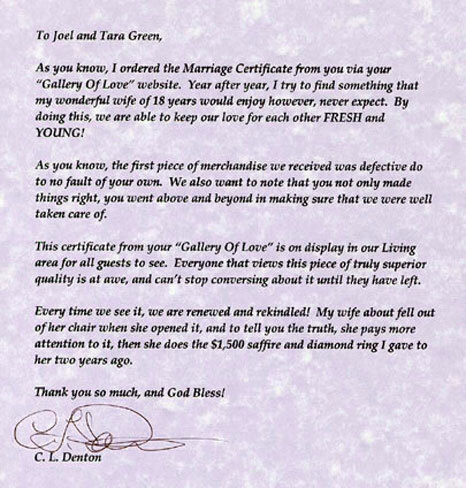 Your customer service was above and beyond, and it is easy to see why your site is called Gallery of Love, because it is apparent that both you and yor husband put a lot of love and time in to making others happy with these beautiful remembrences. "Just wanted to say how great I think our certificate looks. We just got it today after it shipped on Monday (WOW!). I've given you guys a recommendation on The Knot message boards as I know other Detroit brides are having vintage weddings...so far they have loved your website too..."
Thank you, Tara and Joel! P.S. Please know that I will also remember your website when those grand-babies start arriving in the world! Hi! I just wanted to let you know that you have the most beautiful and thoughtful items! The hardest thing about looking at your items, is deciding which one is the loveliest! I am glad I found your store and look forward to doing business again and again! I received the package yesterday....I am very pleased with the certificate, it's beautiful and will make a great wedding gift. The certificate arrived this morning and it is Perfect!!! Thanks So much for that..She is going to love it I just know it.